Posted by jupiterorbit in Solar Energy. When I first bought my Solio solar powered battery charger, after one month of use I came to the conclusion that you would never in your right mind need to or even want to use such a device if you lived in a modern city environment where access to electricity was available everywhere. Well this blog entry sees me eating humble pie or put another way, eating my own words. I’ve recently started to use my Nokia N82 and N95 extensively for data and power intensive uses. I’m quite hooked on Nokia’s sports tracker software which enables you to track your walks, jogs, bus and train journey where ever you go using assisted GPS and the 3G network. Any phone that has GPS turned on and 3G going at the same time will struggle to give you more than half a days worth of battery power. In general, I’ve found that on the Nokia N82, I get about 4 hours of continuous use of Nokia sports tracker on a fully charged battery before it gives up on me and the N95 is just a total disaster with under 2 hours usage. Add to all this the fact that I’m now constantly taking photos on my mobile phone and uploading throughout the day to Flickr and also using Nokia’s OVI social netwoking community more and more which means I have further reasons to drain my mobile battery very rapidly. In these situations, especially when you’re on the movie and not close to a power socket, I’ve found the Solio to be an instant life saver. I can effectively double the battery life of my N82. After just 20-30 minutes of charge from a fully loaded Solio, I’ve bought myself 4 more hours of usage. The more I get in to power hungry applications on my Nokia, the more I am appreciating the benefits of having a portable charger such as the Solio. Often, solar chargers are touted as money saving devices. I’m not entirely buying in to this, purely because if I was to seriously impact my electricity bill as home, I’d have to be constantly charging my mobiles up on the Solio and this is not very practical given the fact that even on a sunny day, assuming you constantly keep the Solio pointing directly at the sun (something I often forget to do) it takes up to eight hours to charge up the Solio to full capacity. Given that quality sunny days in the UK are quite similar, this means I usually charge my phones every night off mains and then use the Solio as an emergency backup when I’m on the move. If, however, you own just one mobile phone and you live somewhere where you don’t have access to high speed networks or don’t talk often on the mobile, then s full days charging of your Solio, followed by over night recharging of your mobile may work out perfectly for you. That’s also assuming that where ever you live the sun shines all day without a cloud in site. A tall order for even the sunniest of climates, would you agree? Posted by jupiterorbit in Energy conservation, Recycling. a) staff who never-ever turn off their PC/Mac workstation even when there’s no good reason to leave it on over night – sheer disregard and laziness. This includes monitors and TV which are left in “power save” mode or stand by. b) offices where the air con is not programmed correctly to switch off over night and come on automatically in the morning. Most offices I’ve worked in just leave it running three hundred and sixty five days a year, twenty four hours a day. c) employees who leech off their company electricity to recharge their various phones and MP3 players but never remember to unplug the charger, therefore leaving a trickle discharge occurring all year round and costing the company and the planet. d) Lights that are left on all night and weekend, whether the building is open or whether or not there are any staff working there. e) and finally, atrocious and sometimes non-existent policies on recycling. a) no-one had waste bins next to their desks to reduce the amount of paper waste that just went in to the table side bin. Instead, staff was forced to walk a couple of steps to the recycle point and dispose of their desk waste in the appropriate receptacle. A great idea, as most of my colleagues around me just dump their paper waste in the bin right next to them when they ALL known that the towering grey bin just 5 meters away in the recycling bin. b) all the kitchen areas on all floors now have extensive waste recycling bins with prominent notices to inform staff and request that they dispose of their waste items in the appropriate manner. a) use wooden disposable utensils instead of plastic – or normal cutlery which can be washed and re-used. b) the IT department will take batteries and compact disks send them to the local council for recycling. c) regulated air-con which isn’t left on all night. d) encourages staff to recycle paper – although we all have desk bins and I see, all too often, many colleagues just dumping perfectly good recyclable paper in to the desk bin instead of the recycle bin. e) office lights, ARE switched off over night and on weekends – at least the floors owned by the company I work at. Through pure gut instinct and partially based on experience, I feel that most companies don’t have robust systems in place or company policies to ensure better use of electricity, especially when it concerns the way staff just leave computers, monitors and TV on all night or on stand-by. This must surely be costing companies dearly yet I hardly ever see any companies I’ve worked at doing anything about it! In conclusion, there’s a hell of a lot more that corporations can do to save themselves money on energy bills which in turn will contribute greatly towards reducing the carbon footprint of many of our cities in the UK and around the world. This weekend, my better half and I decided to go on a lovely trek through the English countryside. We had planned to make it a rather technology intensive trek in the sense that I was going to track the entire walk using my Nokia N82 phone and the Nokia Sports Tracker software. My wife was going to photograph each major way point on her Nokia N95 (first generation). We both knew that the N95 was liable to run out of power half way through the day due to its notoriously bad battery life and I suspected that the N82 would probably give up towards the end of the walk if the GPS was going to be operating constantly for 4-5 hours. Both my predictions came true but the situation was half retified by having the Solio charger at hand to boost the N95 battery back up to almost full. At the start of the journey, I had three flashes on the Solio power indicator, which meant it was about half full. I strapped it on the back of my rucksack so that the solar panels were exposed to the sun whilst we walked. It was a mostly overcast day with occassional breaks in the cloud. The Solio managed to get a few bursts of energising but on the whole I think I was just relying on it’s already stored capacity before the start of the journey. 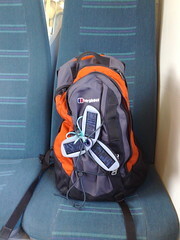 I found it quite easy to strap the Solio to the back of the rucksack. I just used a short length of nylon twine which I usually use on garden plants, passed the twine through the central hole and tied the Solio securely to the rucksack. You can see this in the photo. At the half way point, when we stopped for lunch at a lovely pub, the N95 finally gave up. I plugged the charging cable in to the phone and tucked the N95 in to the top flap of the rucksack. At the end of lunch I took the phone out and hey presto, the N95 was topped up to what appeared to be full charge. Towards the end of the journey my N82 also gave up, having had the GPS running for a full 5 hours, straight. Unfortunately, charging the N95 has drained the Solio’s internal battery completely and so the Solio was unable to give my N82 a power boost. Still, I was quite impressed that I actually go to use the Solio in a properly real life situation. I guess this is what the Solio was really made for and in this case worked really well. I’m glad I took the Solio along as otherwise we would not have been able to photograph the second leg of our trek. It has now been one month since I started using the Solio portable solar charger. I’ve used it at home, taken it on holiday with me and had a good chance to play around with it and charge a number of devices. In conclusion, I would have to say that such a device is mostly a frivolous purchase for someone who lives in a city with access to constant mains electricity. It’s a great thing to have if you regularly run out of power on your mobile phone live in a very summary climate, however, in the UK when the sun rarely shines, I have found it a pain to keep the Solio constantly charged up. In average UK weather, which is mostly cloudy, most of the time, it takes about a week to charge the Solio up about half way (if you’re lucky). On the odd occassion when we do get very sunny weather, you can boost the battery up to full charge in about one to two days of constant sun. If you happen to be going on holiday to a sunny climate where you know access to mains electricity will be sparse then the Solio is a great device to own. You could leave it charging in a south facing hotel room, or if you’re climbing/walking/mountain biking you could also hang the Solio off the back of your backpack. Oddness. Although I had four flashes of the LED on the Solio day before yesterday, meaning that it was in theory 100% charged, I actually managed to get it to flash five times yesterday! I had left the Solio out in my garden for most of the day to collect some energy. I’m going to have to look this up in the instruction manual! Maybe I’ve got my intepretation of the number of LED flashes totally wrong? Anyone know? Now you know, and so do I! Today is sunny all day! Nice and warm, about 25C. Summer is here! I got my Solio charging on the balcony at work as soon as I got in this morning. This means it’ll get solar charging for eight and a half hours. I’m eager to see if the battery charges up beyond two flashed of the LED (50%). I’ve repositioned the Solio several times during the day so it’s facing directly towards the sun so that it collects energy in the most efficiant manner. So the Solio has been outside all day in direct sun. For the afternoon I was unable to check it to make sure it was pointing directly at the sun but when I did come back at around 6pm it was still fully exposed, although not directly facing the sun. I was disappointed to see that the internal battery had only charged to 50% in all that time. Maybe it was the fact that it wasn’t point in the right direction. Not sure. I’ll have to run a more controlled charging test on the next sunny day. Fingers crossed! Today was a very sunny day. Unfortunately my office is North facing so I don’t get any direct sun-light at my desk. 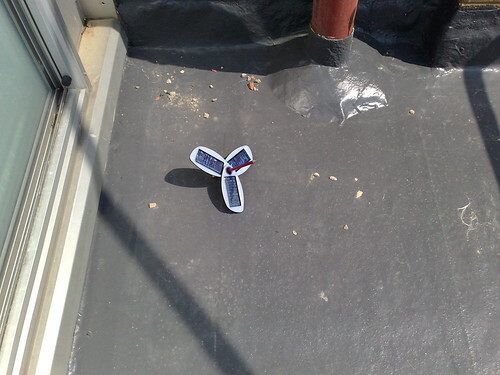 I decided to go up to the west end of the building and place the Solio in direct sun light on a balcony. 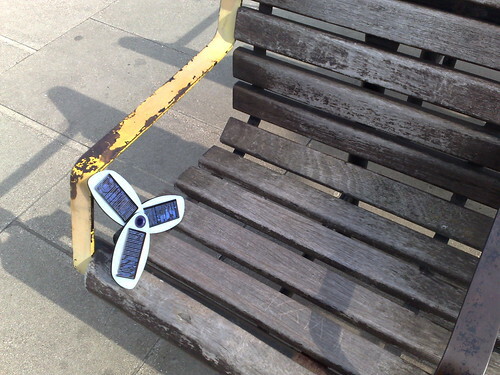 I left it there between 1pm to 6pm in direct sunlight. I picked up the charger at the end of my working day and checked the charge. After five hours of direct sunlight it was charged about 50%. The red LED flashed twice. I used the Solio in the evening to charge my Nokia N82 which was totally dead. I found that the Solio, on half charge, could only give my phone about three bars of energy. I noticed that charging stopped after about ten-fifteen minutes. I’ve been toying with the idea of buying a Solio solar charger or almost two years and I finally gave in to temptation and bought one a few days ago. I thought I’d blog about my experiences with this nifty looking solar powered charger. The Solio charger came out a few years ago and has developed since its release through user feedback and further innovation and product development by Bette Energy Systems, the company behind the Solio charger. The first day I used the Solio turned out to be quite sunny. The internal lithium battery was already half charges so during my journey in to work I placed the Solio in direct sun light whenever I could. To the left you can see a picture of the Solio on a bend at a train station basking in full direct sun light. There’s an LED on the underside which turns red when panels receive enough direct sunlight to start charging the inernal battery. Through the day I managed to catch some direct sun but when I got home the battery was still only half charges. I decided to charge my Nokia N82 off the Solio. I was down to three out of six bars on my phones battery life. Charging was simple. I attached the Nokia tip to the power cable, plugged one end in to the Solio and the other end in to the Noka N82 and pressed the red LED button. There was a short pause for about five seconds and then my phone lit up and went beep. The battery started to charge. When I next looked at my phone the battery appeared to be fully charged – at least the phone screen showed six bars which indicates maximum charge. This took about half an hour to achieve off the Solio. I checked the charge left in the Solio and it must have been almost empty as I only got one flash of the LED. The LED flashes once for almost empty, twice for half full, three times for two thirds full and four times for completely full.